Port of Miami. Downtown Miami. 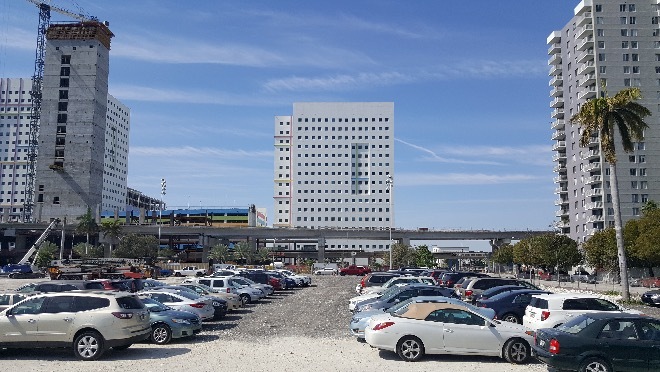 M&M Port Of Miami Discount Parking located at 700 N Miami Ave is just 3 blocks from the port, this is by far the closest Off-Site Parking Lot to the port of Miami, Offering Cruise parking customers an affordable alternative to parking at the port just blocks from the port at a fraction of the cost of parking at the port. This is a huge surface lot. InstaPark is a Parking booking facilitator only, we take no responsibility for any incidents, theft, and or damages caused at this parking facility, we urge you to check the lot facilities before parking here. Q: Upon arriving what do I need to do? A: pick up In front of each terminal, instruction are given to the customer upon arrival to the lot. Q: Will the shuttle driver pick me up from the Port? Q: when I return from my trip what do I need to do? The entrance to this lot is at the corner of NE 8th Street and N. Miami Ave. Upon arrival at a the lot. Please show your InstaPark reservation conformation to the lot attendant. Shuttle is operated by an independent shuttle company and offered as a free curtesy. (2 passengers free, $5 for each additional passenger, paid to the shuttle driver). We advise you to call the shuttle dispatch 30 minutes before your arrival at the lot, let the shuttle dispatch know your estimated time of arrival. Note: Shuttle Hours of operation From 8 AM - 2PM. When You return from my trip please contact the Shuttle Dispatch Jose: 1-954-549-8963 and wait for the shuttle in front of each terminal. Turn Left into 600 Northwest 88th Street. We stayed at a hotel 5 minutes away from lot. We were scheduled to check in to park at 1:30. I called Jose at noon to see if we could park early. At first he didn't answer and mailbox was full so I couldn't leave a message. Called a second time and he answered. He said the parking lot at 700 N Miami Ave was closed. We drove by lot and it was. He texted an address for us to meet him at. He got us in the lot and shuttled to port of Miami. He said he'd be waiting at the same spot when we returned on Saturday. We waited a half an hour for him. I called 3 times and no answer. Again mailbox was full so I couldn't leave a message. I sent a text saying we were waiting for the shuttle and no response. We ended up taking a cab back to the parking lot. I had booked our parking reservation in September 2017. It would have been nice to have had a follow up email saying they closed or moved! Luckily we had extra time. Otherwise price was good and parking facility was good. Shuttle service sucked! I booked through your website and when i found out that the lot no longer existed, customer service gave me an address as an alternative. I went to the site given and no one was even at the location. DISCOUNT PARKING IS RIGHT! Not only is the parking right, but the price is right too!!! Only $8/day is a fantastic price for port parking!!! Since we are already spending a lot to be on the boat itself, may as well park somewhere that doesn't totally break the bank! I thought that with an 8$ upfront rate there would be silly hidden fees created to make more money off of he honest customer. Turns out the business is pretty darn honest itself as it was straight forward and ended up being very affordable and the parking lot was full but go ahead and book your spot online to be sure. The spots fill up quick I hear and Iâ€™ll be telling my friends about this for future use. Sheesh, definitely a nightmare getting ready for a trip but then once we got to the discount parking lot all was smooth. Parked and the shuttle was there. Most of our bags were fairly light but the driver helped us anyway. The kids liked the shuttle and had fun with the driver who was very nice. Got back from the trip heading home now, all was well at the lot and our car was there waiting for us! What more can I say about M&M Port of Miami Discount Parking , solid parking lot with security and just 10 min ride to the port. The shuttle was free so that was cool. Just 8$ a day. Everything was pretty smooth. I'm really excited that I've finally found the one... The parking lot that I'm going to park with until the end of time!!! hahaha! I love seeing good service, and that is definitely something you will receive here. Good job to all of the staff and security. The parking lot was somewhat chaotic, but its only 8 bucks aha so what can I say. Itâ€™s a good sign that they were so busy and I still was happy with how it all went. I felt very tired after commuting to the parking lot. I sure was grateful for the shuttle! Jose is the driver I think and he was very nice. The shuttle bus seats are so wide and comfortable. I have definitely began falling asleep on them before. They seem pretty organized since you have to book online in advance. Showed up with my booking and they directed me right to my spot. Iâ€™m in the shuttle now and its pretty spacious. Iâ€™m the only one in here haha. Feels like I have a personal driver. Hereâ€™s hoping for a safe and fun trip! Your driver was great. Gave all he could to make our experience great. As for the company, I give them a poor rating because when you change the address to the lot and do not let people know, that is a very poor choice to make. You made your driver work very hard to make things happen. Not right. Will choose someone else next time. Too bad. The parking lot was really busy but the obviously deal with this kind of traffic a lot, because they directed everyone pretty easily. Even the security guards were kinda helping people maneuver and show them the correct ways to go. They all worked together which made everything easier for the customers too. I have a monster of a truck but they had no problem fitting me in with my oversized vehicle booking. They werenâ€™t messing around when they said they could take me in. Very accommodating and took care of my baby truck while I was gone. Happy to have returned to her without any problems and on my way home now. The ride felt really short there and back from the parking lot to the port of Miami. I guess Iâ€™m used to things being so far away from each other.. The shuttle was the best part of the deal since itâ€™s such a pain driving right down to the port. Way better off to leave your vehicle here at M&M Discount Parking. the shuttle bus driver is literally the best! He is so charming and witty. He always makes my day! He has been with you guys for a while... GIVE THIS MAN A RAISE!!! hahaha, I don't really know how much he makes, but I just wanted to be dramatic. hehe. It's so nice to know that my car is safe when I'm away. The security guard is always there to make sure that nothing sketchy happens to the cars parked. It's actually very refreshing to see a bunch of people who care as much as at the staff/security at M&M discount parking! Something as simple as parking can be so complicated nowadays, so Iâ€™m glad that this was an easy process for me who doesnâ€™t like overcomplicating things. 8 bucks per day canâ€™t be beat for parking and shuttle service. Solid people working here doing good jobs. 5 stars for sure. I was very happy with how professional the employees were here at knowing and explaining the process to me. I was confused by the shuttle schedule and even tho they are owned by different companies the M&M Parking people filled me in on the shuttle times and what I should expect when coming back. First off, seems they moved the location of their parking lot. I went to the location given when I reserved my parking and they no longer use the lot at that address. That would have been a good thing to know. Secondly, when we call to let them know we were leaving the ship, which was around 7:30, we were told they didn't start until 8:00. They never told us that, So I am very dissatisfied with the whole experience. Interested in parking with you guys. I am going through the booking process, is it really this easy? I don't want to do something wrong and not have anywhere to park when it comes the time to. My family and I found the shuttle to be very comfortable. The driver made us feel at home with his cheer, and he was nice enough to help us unload our bags at our terminate at the port. Same thing when we got back, it was the same guy and he helped load up. No issues at the parking lot so only have good things to say for 8 dollars a day here. 8 bucks wasnâ€™t bad at all for taking a day on the water. My uncles owns a boat so I parked here to meet up with him and some other family to go out into the Bay for the day. Got back to my car safe and sound now. Convenient location here. Parking lots were not paved. Very dusty and not easy to pull luggage. Lots are about 15 minutes from Port. Lots are fenced. Pickup time was good, about 15 minutes. Felt peace of mind immediately arriving at the lot thanks to the sight of a security guard. Iâ€™ve had my vehicle vandalized multiple times when leaving it overnight at certain places so Iâ€™ll be using this place again since everything went well and my car was just as i left it when i returned. Holy Moses itâ€™s hot down here. Just got back from a cruise and the vacation weather is continuing! Feeling bad for the guys working in the steamy parking lot but theyâ€™re service did not falter! Just wanted to say I had a great experience overall and the extra shuttle service that came with the parking was much appreciated. 10 minute ride either way so not bad at all. $8 a day is pretty amazing for this place. Since when did people stop gauging each other for every last penny, am I right? Well, this place was very cheap and came as promised with shuttle service and on-site security. My car takes up a substantial amount of space. I am so glad to have found a parking lot where I am able to park!!! :) I really hit a home run with this parking lot! I parked during the day and came back late that night which was ultra convenient. So glad I used these guys as I know other lots close early in the evening. For 8$ I had a great day without having to pay a crazy hourly fee at other places. This was all i needed and the shuttle was the cherry on top. I am actually in love with the shuttle bus driver. He is so freaking hilarious!! I think he can make everyone laugh. Just a kind, jolly fella. Very honest and thorough service. I had questions about the safety of my vehicle and how the shuttle worked and where it would take me and the gate attendant explained it all to me and made me feel much better about my situation. I left via shuttle and as I did I even saw a security guard patrolling the area so that was great. Happy with my husbands decision to park here! At first I thought that It was too inexpensive and maybe our car would get broken into or something awful like that, but at the end of it I was proven way wrong . Every was very kind and I was happy with the service. Overjoyed with the fact that I got to shuttle over to the port of Miami for free!!! Omg seriously? That is just out of this world! Day parking is one thing but it was great to be able to park here at night. Not many are open as late as this one. I would recommend using this parking to anyone having a day or night at the port or even taking a trip on a cruise or something. SORRY to the other port parking lots, but this is definitely the best of the best. I'm so glad that I found this place. All of the people working here are friendly, and the service is just smooth and easy. Will definitely be returning in the next few months. Parking lot is not in the best area of Miami, but it is fenced all around and there is 24 hr security. The lot is sand, so our car was dirty when we picked it up. We appreciated that the driver who had just left on his way to the cruise port with passengers, turned back to pick us up. It was a 15 minute drive to the cruise port. When we returned from our trip we called and waited about 15 minutes for him to arrive. We think there is only one 7 passenger van working this particular location. It was quick to get back to the highway from the parking lot. Kudos to those working at M&M miami port discount parking. There are many parking lots in Miami, but yours seems to run the smoothest (out of the ones I've been to)... I'm going to continue coming back to you guys! This is quite a small parking lot which i do quite enjoy. The only issue is that you have to book your parking spot early in order to recieve and actual spot!! Sometime in between booking and getting there someone drop the ball and sent me to a wrong address, or old address, after circling 10 times with GPS address I finally called Josie and he said no,no,no your at the wrong place and gave me the new address. I should had received an e-mail or a phone call stating That the lot had changed!VERY FRUSTSTRATING starting a vacation! M&M Port of Miami Discount Parking was perfect to use for myself and my family. Make sure you book ahead of time to ensure that there are spots for you. The shuttle service is a separate company from the parking lot people, but it comes free with a spot reservation. Additional comments - Have a sticker or something to identify those who are waiting for the Instapark van. Also van needs to be easier to identify. Seemed there was no schedule only available when called. The address given was incorrect so were looking for a lot that didn't exist. We finally reached someone & was given another address. This made it seem very disorganized. I am so happy about finding a port parking lot that fits... me! I love being able to relax while parking. Parking lots are soooooo full of hassel and unhappiness ahhaha in my opinion anyway. But it's nice to see everyone relaxed and having a good time, especially before getting on their cruise. We arrived at the address on our conformation only to find it was a construction site. We I called to find out why, I was given a new address. After returning and waiting in the sun for 45 mins, the driver arrived and it was just as hot in the van. Had to ask the driver twice to turn on the air. The driver was on his phone the whole time. We returned back to our car, the driver did not pull into the gate and up the hill. He dropped us outside the gate for us to have to pull our luggage up the hill and we had to handicap people with us. Good thing we booked in advance because you need a reservation to get a spot here. They were really busy but handled everything quickly with each customer at the gate. 8$ per day is awesome and the fact that there is security here is a big deal to feel stress-free. Very easy to book online as well. Security guards is a huge plus since I have had problems with break-ins and it makes me uneasy about leaving my vehicle unattended and in an unfamiliar place. Was told that they will be here night and day for the time that I'm away so very thrilled to feel at ease about the well-being of my car. If you want assurance on the safety of your vehicle I would recommend parking here. Whenever I Go to the port i make sure to park with you guys. Totally the best! This is a great lot to use for vehicle storage when away on trips. I went on a cruise with some friends and we all left our cars at M&M Port of Miami Discount Parking. It was super cheap like 8 bucks I think and there were no issues at all. The staff were nice and we felt trusting of them to look after our cars. We all returned to our cars safely and were glad to hear about this place and make use of the great deal. Having access day and night to the parking lot is very convenient so that you donâ€™t have to schedule your day around what time the lot closes at. We got back late and we would have paid way more than 8$ for parking for the day if we tried elsewhere. M&M Parking is definitely recommended especially with the shuttle service to take you to the port. When we arrived at the loacation in email and printed forms, it was a construction area not a parking lot. Our caravan had to call number listed on papers and was informed that we had to go to another parking area, that that one was no longer in use. We have had this booked for several months so they should’ve emailed us to let us know of the change. The parking area was basically a dirt field with an 80 year old “security” guy. We will definetly not book this parking again. Also, the booking stated we had to pay for any passengers over the 2 allowed, which was fine. We payed the $10 for our extra 2. When we returned the driver said we had to pay the $10 again. That’s not what the booking stated. Either way, that’s what we had planned to tip the driver but they should update their information to let others know it’s for both ways. Got here on a rainy day yet everyone was still working away as if it was sunny and warm. We waited in the car until the shuttle got there and once it did the guy hopped out and helped us get in as quickly as possible. He dropped us at our terminal at the port and even wished us well on our vacation. Nice guy. Over the moon with the service that I received here. SO many great security guards as well as staff members. Very kind and nice people. I will definitely be coming back on my next vacation. Hello All, so happy that I parked with M&M last week. You guys were great to start and finish my trip - lots of friendly faces and great experiences!!! I will definitely be returning on my next cruise of Miami Port. Did not realize that site had been moved so had a problem to find location. The on leaving did not know how to get to Rt. 95 but eventually found it. Also, a little confusing as to place to stand at port for pick-up. Anyway, driver was helpful in leaving and getting back to parking site. After a change in lot location, which was clearly communicated, the ride to the port was very swift. Upon return we were picked up as had been described when we were dropped off. Everything went well and we will be using the service again in a couple of weeks. Wow man, this was a great parking experience. I was so happy with everything. My buddies and I came here because it was inexpensive, and we were very happy with the service that was given. So glad with the way everything turned out. I don't think it's very wise to go to any other port parking lot. This lot has great amenities and is so inexpensive. Not to mention that the staff, security and shuttle bus driver are all pretty amazing. **EVERYONE STOP & READ** Hi All, I was once like you... Skimming over reviews, trying to figure out which port parking lot I wanted to choose as my own... Well, you've found it. Honestly, parking here really makes my trip complete every single time. So glad that I found them. How do I get the shuttle bus drivers job?! hahaha, he has great hours and gets to make people happy all day!!! He's great, but I don't think you'd ever hire me over him. He's the best. Everything went quite well on my trip. I love parking near the port. There is always something so comforting and worthwhile about it. It always smells nice too. Prepares you for the time ahead that you have on the ship. I'm very happy with this parking lot. I'd give it a 10/10! I can't believe how wonderful this parking lot is. I will be coming back soon. Since I go on quite a few cruises a year, I need to have a Port parking lot that works for me!! I have found M&M parking and don't think ill be going back to any other one. It is a little far from the port, but the bus ride goes fast. It is about a 10 minute drive. Holy wow sauce this trip was great and the parking was the icing on the cake. Easy as pie, the shuttle was smooth as butter. I LOVE M&M PORT OF MIAMI DISCOUNT PARKING!!! So many great people around!! the staff is fantastic. I wouldn't change my lot for anything!! Security Guard assured me my vehicle would be safe and sound. I got back and saw the same guard, and he smiled at me as if to say that all is well. Safe, secure place to leave your vehicle for sure. Going on a cruise is always so exciting, I can never hold back! It's great because neither can the bus driver. He really helps pump people up for their trips. It's nice of him to do that especially because he isn't coming :( One day I'd like to see him on one of these ships having the time of his life!!! u know when you go to the port and there is a great smell of the ocean and you just feel... well, good? I had that for the first time the other week, and thanks to your parking lot shuttle you got me there early so I had the chance to walk around. Didnâ€™t have much time to spare to get to the port and with 2 small children yâ€™all know the time shrinks even more. The shuttle thing was there waiting for us, it was great. It was busy but got in and parked in a jiffy. On our way back we were so busy with the fussy youngins that the driver grabbed all our bags to put in the shuttle then even unloaded them in front of our vehicle. Great thanks to M&M Parking lot!! The facility we booked (above) no longer exists but we were not informed in spite of providing email and telephone number. We phoned 30 mins prior to arrival and had to leave voicemail, no one called back. On arrival at facility (now a construction site) we phoned again. A rushed answer telling us to go to another address, he would send a text with address. We were told it was 5 minutes away. No text, phoned again ten minutes later. He insisted he would send text. Text finally arrived. Due to nearby construction most roads were closed. It took a further 30 minutes to navigate the area. Now had been travelling over 3 hours. Arrived at site. No facilities! I asked and was told nearest restroom was at a garage 5 minutes away. This was downtown Miami! I declined. We were now in a muddy field! We have one disabled who had to negotiate the mud and uneven waste land. Our bags were now dirty getting them across to entrance. It was raining also. No cover. Shuttle bus arrived and didn’t have room for all the passengers. The trunk was small and bags were handled very poorly. (No assistance from car to shuttle either) .... getting in to the van was also very difficult. The step up was buckled and in a downward slope. It was wet. Even if dry would be hazardous. We arrived at port. Bags were every which way. Some ready to fall out when back door was opened. A dreadful experience!! Return journey sane shuttle. Same hazardous step, dry but still a safety risk. Had to step further to avoid the risky board. No assistance to car. One nearby driver had a car-starting problem we tried to help them. Young family. No one else around until another shuttle arrived (?) ... (or same one returned) We can’t imagine ever using Instapark again based on this experience and wonder how it could be allowed to operate this way. I have three kids, so my week away was already looking stressful. haha. I was very surprised when we go to the parking lot to see how organized everything was. I had no issues getting the kids on the shuttle and taking off in less than a few minutes. Good work staying organized. I love that the Port of Miami is only 10 minutes away from M&M! It's also a nice drive along, so I donâ€™t mind it at all. The shuttles are so comfy, and the driver helps a lot with luggage assistance. SO nice to park somewhere that appreciates business. Very happy with the way my trip panned out as a whole. So many great adventures, as well as our first time at a port parking. We've airport parked before but it feels a little different when you're going to a port. Thank you for everything M&M Discount parking! The actual parking lot was not located at 700 N Miami but at 1749 NW 1st st. We were not notified and had to call once we arrived and could not find a parking garage. We were met with a nice man who directed us to our parking place but we wished he had said to off load the luggage at the gate because we had to lug it through the sand back to the street. The shuttle arrived after a 20 min wait but it was too small to take more than six awaiting customers. We waited another 20 min for the shuttle to return but due to some police activity in the port it was delayed. We took Uber to the port. We took a taxi from the port back to the garage as we had no idea how long a shuttle would take on return trip. Total we spent out of pocket was $30. We got to the parking place and it was locked up. We called and someone came within 10 min to open it. Not a bad experience, just not quite what was expected from the info provided. The lot was very busy, it was mid-afternoon but there were plenty of employees here to help. I even saw security guards there so I felt pretty good about leaving my car there, knowing there would be someone there at all times since itâ€™s day and night parking. The shuttle wasnâ€™t too bad, canâ€™t complain for being free! The parking lot accommodates oversized vehicles just FYI for those who have large trucks. Fair service comes as advertised. M&M Port of Miami Discount Parking - just wanted to thank you guys for going out of your way to help my kids. You helped the little ones with the bags and Juan, the shuttle driver, joked and spoke with them the whole way to the port! Very warm people here who often make and break the experience. Much more than just a parking service, you can tell. We got to the parking lot to discover it was a construction area. But, there was an attendant on duty so we went ahead and parked (since I had already paid and "made a reservation for pick up). It took about 30 minutes for the van to arrive and take us to the ship. When we got back, we called as soon as we cleared customs. We waited a total of 3 hours for the van to arrive, after being told "I will be there in 20 minutes", "I am there but full", I will be there in 45 minutes". When the van finally arrived there were six people in the van. There were four of us, so there was really no room for all of us. When my husband said he would meet the driver at that spot that he was to off-load his current passengers, he was told that he could not be picked up there. We finally all stuffed in. When we got back to our van we were told that there was only one way out because the lot was now closed and only construction traffic was allowed - we were the last car to leave from the parking "service". We knew this was budget but this was much less than expected! 8 bucks a day is fairly cheap for the area. Hard to find parking in such a good location for such a good rate. I was worried the car would be blocked in by another vehicle when we got back since it seemed busy but the parking lot was well organized and we didnâ€™t have any issues. Drove to the original address to find rubble and demo of a building. No notification from company there was a change of address. I rang the parking company phone number to get a recorded message stating "No one could take my call" I rang the shuttle phone number, the chap answered and sent to me the new address. After driving through a unsafe part of Miami (we stopped at red traffic lights, a homeless woman banging on the front of my car wanting money) only to find we had to park our vehicle in a sand pit. We tried to pull our luggage through the sand. This was futile, the sand was deep and loose. We had two pieces of luggage each and we had to carry one at a time from the back of the lot to the front. This is NOT what I paid for. Upon our return, our vehicle was covered in cement dust from the cement plant located at the back of the parking lot. Never again would I use this company and would never recommend them, ever. The shuttle was great, the driver seemed very bright and was happy to make talk with whoever he drove. Leaving the parking lot with security guards watching over our vehicle left us feeling very settled. Great rates, yet it was anything but â€œdiscountâ€ service. I was very pleased with the overall process of getting to the Miami Port. Juan the driver was really nice. The parking lot was okay, the staff were helpful and took pride in their knowledge of the port and surrounding area. I was nervous talking my truck to any sort of parking lot because of my extended cab. It usually canâ€™t fit in normal parking lanes. But M&M Port of Miami Discount Parking had it covered. They have specific parking spots for oversized vehicles which was great. There was an extra charge but hey, where else offers these spots to leave your larger-than-life vehicle? Anyway, really appreciated that and it was a quick shuttle ride to the port. Off we go! Spent $73.57 for parking at 700 N. Miami Ave. Location is an empty construction site. Paid 3 times as much at alternative parking. Called contact info on confirmation and no one answered. Very frustrating. How to I get my payment refunded. For $8 a day it was quite the bargain! We were scheduled to depart on a cruise late at night so it worked out great that there is â€˜round the clock parking here at Miami Discount Parking. I spoke to a security guard who told me there was always atlas 1 guard there, so you know that this business takes the security of their customersâ€™ vehicles seriously. Very relaxing to be away on vacation knowing that your car is being looked after. Again, very affordable and it comes as advertised. You wonâ€™t be disappointed. Had to haul my oversized Tundra to go on our trip because my families luggage and ourselves wouldnâ€™t all fit in our little Honda Civic. Luckily, M&M Discount Parking had oversized spots available which made our parking situation very straight forward. Everyone was nice there, a young man directed us right to our parking spot and a shuttle stopped infant of us within a few minutes. Very on-the-ball service and pretty darn cheap. Called Jose as instructed by the information sent to me to pick us up. When I got in touch with him, he said to go to a different address. I had no prior communication from you on this and was quite uncomfortable with it as Jose was indicated by InstaPark to be a courtesy shuttle and not an employee of InstaPark. We were not impressed with the fenced in grass area. Doubt we will use your services again. hey, Julie here. I am very pleased with everything going on at this parking lot. So many great employees and staff members. The security guard and driver are very cool as well. Haha, I will definitely be coming back on my next family cruise!! We got back from sea early in the morning and were worried about getting back to the parking lot here. We called the lot to make sure that a shuttle was available and we were told that it was already waiting there for us. Itâ€™s nice for action to be taken before the customer has to ask for it. The shuttle was there and it was the same driver as before. Got back to our car and the whole area was well-lit. Thanks M&M Parking for the great initiative. Had a little trouble finding entrance to the parking lot. Had to go around the construction to finally get to a small entrance to the lot on the north side. a shuttle driver met us there but had to wait for another car to pull out before going into the lot, dropped off the luggage at the entrance to the lot. then had to back in to self park in the lot. Jose was very accommodating to load us into the shuttle for drop off at the NCL pier. When we got poicked up & dropped off at the lot going through the construction zone to get to our car. Realized that this was the last week this lot was to be used for parking. Again, Jose was very accommodating in picking us up from the pier since there were 5 ships in port that day he worked hard to get us back to our cars. Just terrible. The address and location for parking are incorrect. We drove around & around trying to locate address. Finally called & they directed us to a totally different location=Overtown, seedy/homeless area. Called several times for a shuttle pick-up, upon return found cars covered in construction dust. Would NOT use again. Very happy with the service received. Very happy with the people of M&M discount parking!! Miami port has a lot of lots, but this one is my favorite. We were parked here for a week and everything was perfect. As long as all of my stuff is safe, I'm happy. We chose this one over a few others because of some referrals from friends, and their words about this place were on point. The parking employees did not disappoint by being very accommodating and helping my family with bags there and back. Nothing â€œdiscountedâ€ about the service here. 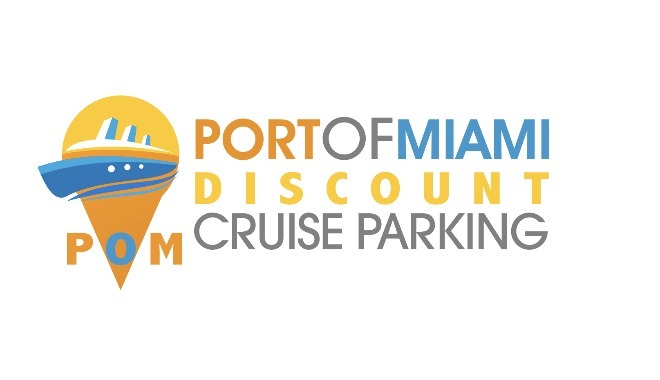 I would highly recommend M&M Port of Miami Discount Parking to anyone going on a cruise departing from the Port of Miami who are looking for straight forward service and great daily rates. I had a great time and the parking was not a hassle what so ever. I don't even go to the port. I just use the lot when i need to park hahah, its so cheap, how could I pass that up??? Employees were helpful at m&m parking lot. The security guard was funny too. Nice to know they actually have security there, I havenâ€™t seen that before at a parking lot like this. We left the port worry-free and the shuttle driver was actually really funny tooâ€¦ Juan I think his name was. The best thing about the parking was the courteous driver who tried his best. The address listed and given to us turned out to be a big waterhole with cranes working. We finally got up with the driver who told us to go to another address. It was a big Dusty lot. The driver waited for us and took us safely to the cruise ship and returned. Our car was very dusty, And when we were being unloaded from the old van the suitcase ended up in a dustbowl. I could not find the parking spot. Drove around several times. No answer on the phone number or for the shuttle driver! Wound up parking at the port garage and paid $110 . I need a refund from instapark! Was over booked and had to find another place to park. But you still charged us for the down payment to park there. Got to original parking lot. Was told it was full and we had to drive to an overflow lot. Was there over an hour, with shuttle driver saying numerous times that he will be right there. Had to call an Uber driver to get to the pier. Was told we could pick up the car 24/7 because the lot was always manned. Got back to lot (uber again) after cruise at 5:30 pm and we were told to come back in the morning. He did not want to let us into the lot to get our car. He finally agreed to let ME in, but made my husband and the male Uber driver wait outside. According to the Uber driver, the lot attendant then changed his mind and was considering not letting me out ! Very unsafe ! Finally he let me out but I will NEVER be back and will NEVER recommend you. Ants in car when we returned. Dirt and grass parking was the source. 8 BUCKS?!?! woah man that's crazy talk! Any other parking lot I've been to has been sooooo freakin expensive man!!! GREAT VALUE! My spouse and I took a cruise a few weeks ago and used M&M Port of Miami Discount Parking. We were nervous about leaving our vehicle for a number of days at a random location but it was well-lit when we got there (late at night) and it had security guards there too. We also didnâ€™t know what we were getting when it was only 8$ a day but the service was great. Honest, hardworking people there that deserve to be supported who are offering handy parking. Would definitely use again. U r a good parking lot. I think about short term and long term parking lots and you are definitely on the top of my list. It is so easy to like your lot because there is a lot of quick work being done. Everything is smooth and there haven't been any issues for as long as I've been coming here. just simple service done right. The shuttle was not available after arrival and my husband and I had to seat in the trunk. Iâ€™ll be telling all my friends and family about how smooth this parking experience was. And I honestly loved the shuttle, it was clean and spacious and made me feel very luxurious. The driver was professional but friendly. I met my friends at the port and felt like a superstar stepping out of a vehicle with my very own driver ;) ha-ha. Bon voyage! I like that M&M is small. It helps a lot with things like walking a long distance to the shuttle bus, and things like that. Plus, there are a lot of older people like me who cruise, and we aren't as mobile as we used to be . I like this parking lot a lot. Not sure how many times Iâ€™ve used parking for when Iâ€™m away on trips but this was one of the better times Iâ€™ve had. The parking lot was very organized instead of cars kinda just being parked wherever. They had lots of staff on hand as well as some guards. M&M Port of Miami Discount Parking gets 2 thumbs up from me! We drove around several blocks three times for about twenty minutes looking for the 700 Miami address and entrance. Called Jose a half hour before we arrived as the instructions said. His voice mail was full and was not taking any messages. So we called the number we booked with and left a voice messag. Finally Jose called back and gave us a new address to go to. A back alley lot. When we returned again terrible communication. A guy walking around with a 3x5 card in his hand speaking terrible broken English. No name on vehicle, he just said a blue or white van. It was very unsettling to leave our new car in that Terrible location. We will never use this company or refer to any one. And we cruise every year. I was so happy and content with the service of this discount parking lot that I have already booked my next visit. It is in a few months but I am still very happy to get it done. Plus the parking lot is small so itâ€™s a good thing to book early. Parking lot changed, never notified. Shuttle number went to mailbox and box was filled. Contact number called and told then where the new lot was located and that shuttle service no longer used. Attendant (one) did not speak English. After waiting one hour for shuttle that never came. Took taxi ($20.00) to cruise pier. Had to take taxi (20.00) back after cruise to unattended open parking lot. This lot is located in a high crime area. I am going to notify the Attorney Generals office, Consumer Division relative to misinformation on the part of your company, leaving my family and I exposed to robbery and possible death in this “Ghetto” location due to negligence on the part of Instapark or M&M Port of Miami discount parking. 700 N Miami Ave Miami, Fl or what ever name and location your using today! We signed up for a parking garage. When we called the shuttle guy he said to go to another lot. This lot ended up being a grassy/dirt lot with a cement wall around it but the wall could be easily climbed over. The ride to the cruiseport was OK. Getting off the ship, I called at 8:53 for pick up at the area where we were told to be. He again told us to go to a different area so we did. We waited and waited and called and waited and called and waited. We were finally in our car at 11:04. He said it was due to traffic. Several times during the 2+ hour wait the traffic at the cruise port was minimal. I think it is just one way of him not having to take people back to their cars as a lot of people paid a taxi to take them back. 3 other couples on the shuttle van said they would not use this guy again. We will not either. He broke my garment bag hanger getting it out of his van when dropping us off at the ship. Donâ€™t let the discount in the title fool you, this is a premium service that offers dependable car storage and security while also having a free shuttle to and from the port. It felt like a very fair deal for 8$ a day. The parking location was changed due to the constructions, but we did not be informed in advance (by phone or by email) at all. We spent an hour or so try to find our reserved parking. We called Instapark’s number and no one answered the phone. Finally we called the shuttle dispatcher’s number and realized the parking location has been moved to another location. On the shuttle bus we heard the same complaints from several other customers as well. Very poor management and not a good business practice from Instapark. Even in this email the address of the parking location is STILL wrong. It was a very bad experience. It started with the address that we were given leading us to an abandoned lot. It was only by trying to follow the printed directions (very hard in Miami traffic when you're trying to drive and unfamiliar with the area) that we finally found the lot. After returning from our trip, we called for the shuttle (20 minutes before needing pickup as requested). When I called, the person who answered was incredibly rude and said that since it's Saturday we need to be patient. I understand being busy but after an hour there was still no shuttle there to pick us up. So when I call back, the same person told me that "you and a hundred other people are waiting for pickups and I'll be there when I get there". At that point, we just took a cab to the lot. I left my wife, daughter and granddaughter at the cruise ship port and after about 20 more minutes they saw the shuttle drive past in the far lane and never stop. I won't be using this lot ever again due to this experience and will be sure to be telling anyone who asks to avoid it as well. Pay the extra money and park with a reputable company and save yourself the hassle in the end! When we were Five minutes away from the lot, they told the location had changed. They had our email and phone # for over a month. No communication on the change. Will not use this company again. The Discount Parking lot for the Miami port was great and very affordable. 8 bucks a day and there was plenty of space. I think the ride was a little far it was like a 10 min shuttle ride but hey, hard to beat down here with very cheap parking. Very happy with the service, 10/10. Too frantic the pickup and dropoff and day of embarkation it took too long fpr pickup despite calling Jose well beforehand. It was really busy and I got a bit anxious but the line of cars was moving quick and I got my spot. The man at the front was nice and quick and then there were guys within the parking lot helping people with their bags and directing them to open spots. The shuttle came thru really quick and picked up. Glad to have used M&M Discount Parking. Parking was fine, however the location had changed and we were not notified until we arrived and called dispatch. Parking attendant was very nice and shuttle driver was very helpful. Lot had been moved and we received no notification whatsoever. When we got to original lot there was nobody there and so we went around in circles eventually coming back to the same place when someone there met us and gave us a flyer showing where the new lot was. The new lot was very poor and the bus driver was having nightmares dealing with complaining customers who were at other lots. Words cannot possibly describe the disaster that was a part of this experience. The lot that was booked was full, was sent to another garage which was also full. Drove around for over 30 min in search for a space with no luck. Was told to go across the street to park and finally found one of two remaining spaces. We had to take a cab to the cruise terminal after waiting for a shuttle that never showed up. Upon returning from my cruise, my friends car was broken into, my car had numerous bottle caps on the trunk and there was no explanation or apology. The shuttle driver was extremely rude and told us we were supposed to leave our keys with the attendant (NOONE EVER TOLD US TO LEAVE KEYS) which was never going to happen anyway. This was the most unprofessional conduct I have ever encountered with a business. I will never again use your company. Good company. Driver was a little difficult but we got to our cruise quickly. Once we called from our cruise to be picked up at the end it took 45 mins for the driver to show but we then got back to our car quickly. Upon arrival police were at the lot as numerous cars had been vandalized with windows broken. The shuttle took over 40 minutes to pickup for the port. At pickup (we took a cab as the shuttle was a joke) the gate was locked and nobody was there...I called and was told there was a construction entrance to this empty lot that they called a parking lot....We finally got in. Terrible experience. This was supposed to be a parking garage. When we called to set up shuttle time, we were directed to an "over-flow" lot that was a sparsely grass-covered sandy lot. Shuttle service was terrible. We had to wait 45 minutes for the shuttle and then we were packed in to get to the ship. This certainly not what we expected. Did not like we were told to call 30 min before arrive and when called got a text to go to another location. Did not like the dirt parking lot, did not like that once we got there parking was at our risk and no camera, security. We were handed a paper that states any damage to our vehicle was our responsibility. We waited a long time to get to the cruise port and pick up after cruise was bad, we took a cab because of long wait. First we could not get ahold of anyone the day of arrival and then were were told we had to go somewhere different. Then we waited in the dirt and crowded into a van. Leaving was horrific!!!! I called and could not reach anyone for at least an hour and then when I finally reached someone it was almost another hour and a half. Then I had to complain to the driver that I was the one that had been calling for the last 2 and a half hours and he told others they could not get in the car. IT WAS VERY STRESSFUL AND UNPLEASANT!!!!!!!!!!!!!!! The location was hard to find. Multiple phone calls with a rude gentleman finally got us redirected to an alternative site in a VERY high crime area. I was concerned during my entire cruise about the safety of my vehicle as the attendant at the alternative site was very dismissive of my concerns. When I returned the lot was locked up and I was uncomfortable waiting on the side of the road with my luggage for someone to open up so I had the cab driver take me to a safe haven to wait. VERY bad experience. It was very confusing finding this parking lot, it took me about an hour to make sure it was the correct one. There was no one there for any questions or anything and there were rocks everywhere! I WILL NEVER USE THIS PARKING LOT AGAIN! I had a terrible experience. The parking location was changed because of a huge construction project. I called the company number and was told that the location was correct, so I drove into the construction site and tried to find the pickup location. It was only when I called the shuts driver did I receive the correct location. Otherwise for the cost the parking itself was ok.
We went to the agreed upon address for parking but they had over-booked and was FULL. The person directing us did not speak English. He showed us an address to go to. We are not familiar with Miami and had trouble finding the second address. When we got there it was a parking garage. There were 40 or 50 people waiting for a ride to the cruise ships. There was only one van shuttling people to the cruise ships and it took a long time to get to the ship (luckily we made it). AFTER the cruise and we needed a ride back to the car, there was again only one van shuttling passengers and it took a long time to get a ride, (there were multiple ships in port disembarking at the same time). The person driving the van was also the person answering the MANY phone calls from people needing rides.... We had no idea where to go (port of Miami is HUGE). It took hours to get back to the car! Company needs 1- MORE VANS. 2- SOMEONE TO ANSWER THE PHONE BESIDES THE DRIVER. 3- SOMEONE WITH A SIGN AT THE SHIPS DIRECTING PEOPLE WHERE TO GO TO GET PICKED UP BY THE VAN DRIVER. 4-STOP OVER-BOOKING. 5- IF RE-DIRECTING PEOPLE THAT PERSON NEEDS TO KNOW HOW TO SPEAK ENGLISH. I will NOT use this company again ! 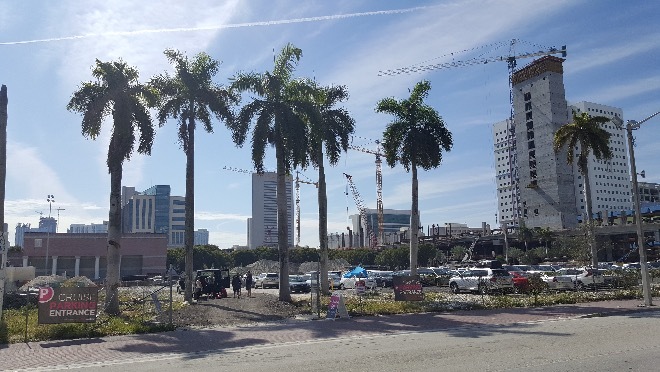 After driving around Miami looking for the parking lot that was unmarked and ended up being a gated construction site we finally, after several attempts to call instapark we were told to go to a different address. That lot was a lumpy, sand pit. After waiting another half hour for the shuttle that never came we had to get a cab to the cruise terminal. Our return trip was no better. No shuttle ever came after being told to walk about 15 blocks to the opposite end of the terminal. Another cab fare for another $20. to get back to our car. So it ended up costing us $40. And over an hour of frustration. NEVER AGAIN Instapark. Parking location changed without notice. Parking location a dusty not graveled property. Parking attendant very nervous and took many tries to finally park car. Our car was broken into. Many cars were. Unacceptable. I used InstaPark because of good reputation in Houston where I live. Never again. We were told to park at 45 SE 2nd Street and when we got there no shoes were available. We rode around for quite some time with no one to talk to before someone told us to go back in and wait for someone to leave. It was very frustrating but we finally did find a spot. This was not a good way to start a vacation. However, the rest is the experience was excellent as Jose was very quick at picking us up at the cruise terminal. Sent from original parking lot to garage numerous blocks away. Repeatedly drove around garage looking for vacant spot.Unsuccessful, then directed to parking lot across street. Parked car and attempted to obtain van to ship. Chaos, with too few vans available to transport passengers to ship. Had to take taxi to ship. Returned to Port and attempted to obtain transport back to garage for car. Due to another undetermined wait for transport, took cab back to parking lot. Upon arrival, found car with broken window and prior entry, where car ransacked and items removed. Contacted Jose, waited forty minutes for his arrival. He indicated that we were supposed to leave key and they would have moved car in to garage. Informed him that we were never instructed to leave key. He indicated that he would check into matter for window replacement. Awaiting follow- up for window replacement. Finding the new lot was easy sence the lot at 700 n. Maimi was closed. the problem was after one Hour of waiting no one came to pick us up. 30 people waited for a ride that did not show. we had to flag a taxi to get to our ship. When we got back from our cruise no pickup van, hailed another cab. My car was broken into. Your driver told me he was very sorry and he would be in touch with his boss and they have would take of everything. He called a couple of days later and told me all they would pay of my $290 repair was $150. If I wanted to drive back to MIAMI FROM TAMPA the $150 would cover it. You didn't hold up your end of the agreement and I will tell everyone I come I come in contact with about my experience with your company and to not do business with you under any circumstances. This includes the travel agent. Not notified of lot address change til called day of parking. Difficult to find and rough terrain on lot for walking, driving and luggage. Your shuttle dispatch Jose was, in my opinion, very rude. Had to call multiple times going and returning before call answered. Unclear explanations & directions for parking and pick up locations. He yelled at me on both 12/1 and 12/4 phone calls. Very unprofessional behavior. I unfortunately will not book with your company again as a result. My car was broken into and a lot of stuffs were stolen from it. its not the only car in the lot which was broken into - There were 12 similar incidents in two weeks as per cops. On arrival, we were told to go to the covered lot. However, the directions were poor, so we ended back at the construction lot. The worst experience occured on return from our cruise. We were passed by three time by pick-up, and waited over a hour toget on a ride back to the lot: not good! Terrible service. Driver rude and rushed. Parking did not state it would be in a dirt and muddy outdoor lot. Never using them again. After a twenty minute wait, the van arrived on the lot to load around 11 passenger to the cruise port. It was a little crowded, but it was less than a five minute trip to the port. A week later, we phoned the driver upon debarking the ship and he was already at the terminal at 7:45AM retrieving other passengers at 7:45AM. Our wait time was measured in seconds. We were back at the parking lot by 8:00AM and in my car heading home five minutes later. Instapark helped us get home in record time. I will definitely consider them on our next cruise from Miami. Parking was convenient to the port and much better priced. waited for a shuttle back to parking almost 2 hours. Great price and close to the port. Very kind personnel. I would park again in the future. Upon arrival we were directed to a different parking facility due to unknown circumstances. When we found the new facility there was no one there so we weren't even sure we were at the right place but we could see other people with luggage so we parked. We called the shuttle driver for pick up and he was very unfriendly saying how busy he was. When he arrived for pick up his vehicle was not marked clearly and it was difficult to locate him, in fact another passenger had to tell us who he was. We were told at dropoff where to be for pickup for the following week. After the trip we called for pick up and a driver showed up within minutes however by the time we started to pick our bags up he already drove off. We called the shuttle driver four more times over the next hour and a half for pick up and finally he showed up. Every time we called he would complain about the traffic and how busy he was. I will never use this service again due to the lack of communication, lack of professionalism and lack of common courtesy. 1. Upon arrival at the originally reserved lot (700 N Miami Ave), found a horrible industrial lot where three other couples returning to their cars had found their cars broken into. We weren't going to park there! 2. Called InstaPark to ask for where else we could park ... got no answer; had to leave a message. Called shuttle driver number, and he told us to instead park at the SE 2nd Ave location. Fine. We drove there and parked. 3. Shuttle to cruise ship was completely packed. My wife had to sit on my lap, with bag on her lap. 4. Upon return to port, we went to designated Post 10 Equinox and called shuttle driver, who told us to "wait there". Waited and waited, then called again at 9:15; left a message. At 9:17, received text saying "on my way". Waited and waited, calling and texting several more times with no response. Called InstaPark at 9:45 to ask for advice; again no answer so had to leave message (never got back to me). Continued waiting and calling/texting shuttle driver (never any response). He FINALLY showed up at 10:15 -- and then was FULL again!!! We had to again sit on laps with bags crammed in everywhere. HORRIBLE SHUTTLE SERVICE. 5. Upon return to lot, a couple who'd arrived earlier told our shuttle driver that their car had been broken into. He rudely barked back at them "so call the police" and turned his back on them. Luckily our car was not broken into. 6. Upon exiting the lot, I had to go across the street to get another parking attendant to open the parking lot gate for us. No big deal, but why isn't there an attendant on-site during the heavy traffic period? Given all this, I would never use InstaPark again, and will of course tell my friends and family to avoid you as well. When we pulled in to drop off our car we were told that 10 cars had been broken into the week before and items stolen. I had nothing to steal in my car so I was not worried. Your shuttle service was horrible. You need more then 1 shuttle as the wait time for pick up was very long. I would not use your lot again. The parking area was a construction site . No one was there to help . My car had a flat tire when I went to pick it up . When we got to the parking site fromoir Cruise . We had to wait until 8am for them to open it up so we could get to our vehicles . Mind you ,we docked at port of Miami at 6 am . When calling customer service . It would go to voicemail . And if you did get to talk to someone they were rude and dismissive . I am in the customer service industry and this was a huge fail . Not a good experience whatsoever . Small Mom & Pop Operation. No signs to identify lot. Then lot changed to another lot. Then no response after calling several times upon arrival making the entire experience a very anxious one. In the end it all worked out but the experience was intense! Horrible experience! Had to uber from ship to parking as jose didn't return phone call! Initial parking disaster as well..lot full..sent us to a construction site! Got what i paid for i guess! Oversold Parking at this location. Agent kept sending other customers to another lot. We waited over an hour for the shuttle to the port! Coming back was great! I arrived at the 700 N Miami Ave parking lot, which did not have any sign, only to find it was full- no parking available. "Jose" directed me to another parking deck at Miami and 1st which was also full - no parking spaces. An attendent there directed me accross the street to another parking lot on SE 2nd St. I parked there not knowing if my car would be there when I returned. Luckily, it was. I had to find my own transportation to and from the port. Bad experience! Never Again. Homeless people live between the cars. They oversold the spaces we drove in-and-out of different parking garage .And parking lots it was terrible. Then we waited over one hour to be picked up. Parking lot was full and has to relocate to a random garage. Shuttle never stopped us off or picked us up so we had to pay for a cab both ways. The lot was awful and with no security and we were finally given directions somewhere else and got lost for half an hour and still was not sure if it was the right place, so we were worried the whole trip that we would have a problem when we got back. Again, terrible experience. First time using a lot and it was not as i expected. The price was excellent but we were sent to a parking deck on 2nd Street that was quite a bit further away. Both locations were filthy and the deck where we parked smelled awful. Also, there was no apparent security at either of the lots. i don't want to worry about my car when i'm cruising. i think that i will park at the pier next trip. Great overall experience. Will definitely use again. Called for Juan pickup ,was told to wait one place ..then called go to another,he will be there 8:00 blue van ..waited and then came 9:00 white van, squeezed so many in van had to sit onto women with man onto me 4 large adults on one seat,overcrowded..Why so late ? And overcrowded?? Never parked there, could not find it. Had a terrible time finding the entrance to the lot. Had to drive around in traffic about an 8-block cycle 3 times before we could find how to get into it. The entrance was not on the street that the address was on. Would have help to get this info ahead of time, but perhaps it was due to the construction in the area. 50 vehicles broken into over 3 week period yet lot provided no night security and continued to rent to folks. Contractors using the lot as a construction area. Back gate not locked. Criminals put a piece of concrete in a shirt and slammed it through my back seat window of my new 2016 Ford Crew cab. Stole a few items and damaged more. Scratched the clear coat finish below the window. No offer from lot management to replace the stolen items or repair the clear coat. Dirt construction site.No marked van. Waited for one hour at the port and no blue colored van showed up.Finally called. Luft driver to take us to the lot. We had no issues but when we returned we heard that other people had break ins. DO NOT PARK HERE!!!! 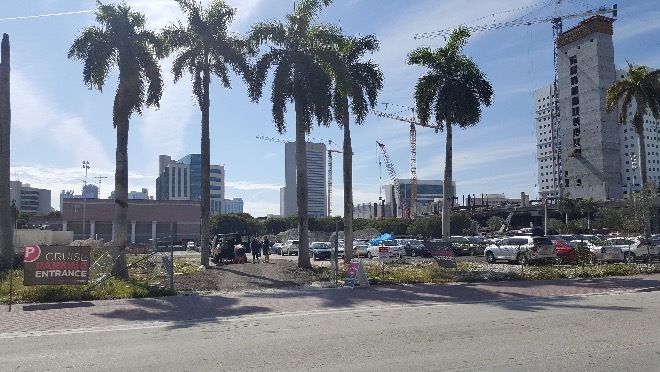 It is an empty DIRT lot in one of the ABSOLUTE worst areas in Miami. It is surrounded by homeless, drunks, drug addicts, prostitutes and drug dealers. A number of cars were broken in to during the week we were parked here. Fortunately, ours wasn't one of them. The shuttle driver, Jose, is very rude and unsympathetic. Again, DO NOT PARK HERE!!!! Lot was full. Requesting full refund. I never parked at 700 N Miami Ave. There was no parking lot there, just a construction site. It was clear that the parking lot was used for the construction project. Nowhere on the website was this mentioned. So I payed $56 for a parking lot that didn't exist. I ended up having to find alternate parking that ended up costing double what I had already paid for the bogus Instapark parking lot. I also tried to open live chat to talk to someone about this, but there was no response. This was clearly not a secure facility, as advertised. The shuttle service was horrible. The driver was surly and wanted us to sit on other passengers to "squeeze" everyone in. Coming back was even worse, driver was rude when we called and when we got there, driving dangerously while on the phone and made a number of stops along the way including one where he pulled over for 10 mins to text another driver some other client's info. While I understand this is a subcontractor and your description absolves you of any responsibility, Instapark's name is associated and reflects terribly on you. Lastly, when we arrived, we learned that a number of cars, 15, were broken into while on the cruise. The lot owner (I presume) had the smashed windows changed without advising the owners of the vehicles who realized what happened once they saw items in their cars missing and bits of glass. Police were involved. Needless to say I will never park with you again. I was not notified that the location was moved to a parking garage. An email would’ve be good. Parking lot overbooked. Cars broken into. Bad communication. Shuttle slow. I had a reservation on Saturday, November 18th at the Port of Miami lot. I have called five times and left four separate voicemails to try and contact someone regarding a refund on our reservation, as when we arrived at the lot, there were multiple cars that had been broken into with inadequate fencing and security surrounding the lot and we decided immediately not to leave our car there. I have not been unable to reach anyone successfully via my phone calls, so I have separately followed up with two emails. I have still not received any response to my calls/email. We submitted photos of the cars that were damaged - several windows were shattered &, personal belongings were taken from multiple vehicles. In addition to the poor conditions on site, there was no one to talk to at the parking lot and no active number to reach anyone. The lot is in terrible condition. I understand that this is an affordable alternative to parking at the cruise terminal, however, please beware of the risk you are putting your vehicle at if you park here. Also - the customer service and ability to contact anyone is extremely difficult. I am still optimistic the company will do the right thing and refund our money, as we are still awaiting a response. It was horrible. It was not a secured entry lot. 5 cars were broken into when we got back from our cruise, ours being one of them. We have thousands of dollars in damage and theft. Horrible experience. I called the owner when we were there and it went to voicemail. Called the next day, voicemail again. WORST EXPERIENCE EVER. No exaggeration. Miami Police Department said this lot was a common place for theft - happening every week. I wouldn't wish for my worst enemy to park at this site. Just horrible. Waited at the lot when we left for our cruise for a while to get a ride. Really wasnt terrible, but when we returned we were off the ship early and called the number to the driver and was told it would be quite a while before we could get a ride... We were first off the ship, no one else around, why was it quite a while? Ended up passing$20 for a taxi to take us 2 miles.... Oh well. Tried calling the lot vans for pikcup when we returned from our cruise and both phones went to voicemail and the voicemail was full. Cars around me had been broken into and the glass had been replaced. I'm not sure who replaced the glass the lot of the thief. Lot also charged me $10 for a ride to the port and nothing was mentioned about that when I paid for parking. Very unprofessional and I'll never use this service again. A dirt lot that made my vehicle filthy and poor signage made this a location very difficult to locate. Poor fencing and easy target for theft area. Shuttle was useless, waited 45 minutes then took a cab. No security - returned to piles of broken glass - not our car luckily but we counted 15 cars in the lot with broken windows. Very long wait for shuttle driver. 45 minutes. Last people to leave the port after getting off of ship. Had to wait a long time to get dropped off too. Need to hire more than one driver. You are working Carlos to hard! Lot needs to be cleaned of trash. Other than that the lot itself was fine. The company contracted with for transportation was unsatisfactory. We had to rely on taxi service in order to return to the lot. When I went to the parking lot, it was full an no space. There were lot of people waiting and cops had to intervene. Only the shuttle guys was there who was rude to all who were waiting. After waiting for 30 min, had to go and find another parking space which was expensive. There was no use pre-paying for this. Parking lot was in a sketchy area & shuttle driver even told us upon our return that some people had broken windows. Thankfully our car was fine. It also took a while to catch the shuttle back to the lot upon our return. This is difficult when you have two small children. Terrible my car and about 15 others got broken into so was not a safe place to park only good thing was they had fixed window and all the other cars but will never park there again. So definetly don't leave anything in your cars when parking for cruises. parking lot was a construction zone. Transportation to and from cruise ship was limited. We ended up walking 1.5 miles with our luggage to avoid waiting about an hour to get in the small van they had. After cruise, daughter had to sit on mother's lap to get everyone in on the one trip. What a joke! I should have listened to the reviews! We get there and the lot is not only PACKED FULL, (well over booked leaving us scrambling), but there were no less than 12 cars trying to get in and more coming. The lot is FULL of trash, the neighborhood is, let's just say "not very nice". We drove straight the the port and parked there for just $36 more. Spend the extra, the port charged $20/day and WORTH THE CONVENIENCE compared the garbage this company put us through. I will be disputing the charge, we couldn't park there even if we had a smart car! My parking experience was horrible! I was unable to park there because when I got there to park the lot was full! I am now looking for my $39 in change refund. I've been trying to call customer service, but no one is answering the phone! I got one return phone call back from a lady i could not understand. The lot itself is dirty and I paved, making it very difficult to navigate with wheeled suitcases. The shuttle drivers are independent from the lot itself and don’t seem to know who was next or how many passengers they can fit. We had to wait over a half an hour for the shuttle in an uncovered lot without a proper line to indicate who was next. The “worker” at the lot did not speak English and wasn’t wearing anything to indicate he was even employed there. Trying to track down a driver to bring us back to the lot after the cruise was difficult as the shuttle vans don’t say anything on the sides about Instapark. But the worst was returning from the cruise to find that 30+ vehicles had their windows broken in the lot while we were gone! Luckily, mine wasn’t one of them. I would NEVER trust Instapark with my vehicle again! We could not find any available parking in the lit we prepaid for. I called to cancel the reservation and there was no answer so I left a message. I didn't receive a return call til we were already on the ship and they obviously didn't even listen to my message about cancelling my reservation. I sent an email about cancelling and it's been 6 days and I still have not gotten a response. Apparently to get a refund I will have to go through my credit card company as the communication is horrible and they overbook parking lots. The driver made us pay twice. When we went to pick up our vehicle 10 to 15 other vehicles were all broke into with broken out windows. The lot attendant did not even speak English. The whole experience was horrible. My original reservation for parking was apparently over booked and upon arrival we were brought to a different parking lot location. I made a reservation with this company because I wanted that particular parking lot due to its close proximity to where I had to go. The shuttle service efficiency is poor and lacking. In my opinion, if you’re going to charge people for the shuttle, it should be pretty efficient. In addition, if it was due to your fault that you had to change our location, you shouldn’t have to had to had to charge us for an additional person. That’s an evidence of very poor customer service. Will definitely not book here ever again and will definitely steer people away from making a reservation at this place. The time it took to take and pick up to and from the ship was ridiculously unessesary due to only ONE driver working.This building site was not secure for our vehicles as our friends had their vehicle broken into and property stolen.We will not be using your services again.BAD CUSTOMER SERVICE. The parking lot where I had made the reservation for was full by the time I was on my way and I got re-routed to go park at another garage. When we returned from our trip we waited for about 40 minutes to be taken to the garage. There was not a place to put how many people in party that I saw when confirming and that should be required if you are going to charge $5 for each guest if more than 2. That was deceiving and we will not use again. I need an answer!!! $500 worth in damages to a vehicle!!! We need answers!!! The car that was parked at your lot was vandalized. It was broken into. You advertised as a 24 hour security lot clearly no one was there. I will be letting people know about your awful location. Very disappointing paid so much to have our vehicle vandalized. Jose is an asset to your company. He was courteous, prompt and efficient. And, I was not late to an appointment for which I was grateful. Thanks. The service was terrible. Shuttle driver has absolutely no human skills, ride and disrespectful. Waited for over 40min till he showed up, told us he didn’t have any room in the van and left. Ended up getting an Uber to get to our cars. Upon arrival a lot of cars were damaged and had things stolen from them, luckily ours was good. Trust me, pay a little more and get a real parking for your car. Ride back from ship was a 1 hour wait. WAITED ONE HOUR TO BE PICKED UP UPON ARRIVAL BACK IN MIAMI. TOOK A CAB FROM BOAT TO YOUR LOT WHICH WAS $14.00 WHICH ERASED ANY SAVING WE HAD PARKING IN YOUR LOT. ALL ELSE WAS FINE. THIS IS BAD, THERE WHERE OTHERS WAITING JUST AS LONG AS WE DID. AVOID AT COST!!! CAN I GIVE THEM 0 STARS?? The worst parking and shuttle experience in 9 cruises. I don’t even think they are this rude in any of the 3rd world countries we visit on our cruises. Seemed very legit when reserving but then it’s downhill from there. You park in a gravel paved construction zone. Old guy who doesn’t speak English for a “security” guard. When the shuttle van came he was very rude and overworked and told us that there was an extra $5 fee for every person over two. We had 5. But he was feeling generous and said he wasn’t going to charge us for our 6 year old. He drove us around for another 15 min looking for another passenger and we came back to the parking spot where we started from. When we finally made it to the port he gave us a business card and told us to call when we came back. I called when we arrived back and we waited for 40 min, when he finally came he told us that there was not enough room in the van for all of us and we were going to have to either wait another 40 min or just have the driver go back with him to pick the car up. We just ordered Uber who was there in 2 min and we were back the parking lot in 5 min. Upon arriving we found 3 couples who were telling us to not park there as they just got back from the cruise and found their cars broken into, windows smashed and all. I ran to my car and thank God we were fine. We spent $85 all together that’s $65 for parking and $20 shuttle and Uber. Terminal parking would have been $140. You decide whether it’s worth all the hassle and risk. I definitely will not use them ever again! The parking conditions are awful, your luggage won’t roll across this nasty dirt/rock lot. English is pour, the lines we stood in were 30 minutes or longer in the rainy weather. We had to take a taxi back. I would have rather paid $120 at carnival terminal. Waited over three hours in sun with no where to sit after getting off the ship. Getting to ship was very hairy. Parking lot is a dump, literally, a construction site with stuff everywhere, would not recommend to anyone. The only thing I didn't like was the parking lot was not paved. We finally took an Uber to get back to the lot. Couldn't find Jose and he said he would call me when he was at terminal B and he did not! We were quite alarmed when we got to your parking area. It was very difficult to drive through, not in a very savory area, and only one person walking around directing you to a spot. We had to wait a bit for the van to come get us and he proceeded to cram as many people and pieces of luggage into the van. We did not feel really comfortable leaving our car there. The driver of the van told us to make sure we saved his number so he could pick us up. If you had no phone or paper and pen, you were out of luck. We chose to get a LYFT back rather than ride in the van which we never saw while we waited. When we returned to the lot, there was a big piece of cardboard laying on the front of our grill that had blown there. No damage, but it was there. Your price is good, but that is all. Our car was covered with building dust . If they don't like dealing with handicap people and wheelchairs then post it on your website. We will never use your services again or recommended your company. I want my $65 back. Used the service while on a cruise - along with several others. The wait to go from the lot to the ship was about 45 minute standing in the sun. There were only two vehicles transporting passengers and only 4-5 people were all the vehicles could accommodate. When it was our turn, the driver said he couldn’t take five as there too many bags. We only had 4 bags. The driver stood by while we loaded the bags and when asked which ship we were owing to - he acted as thought he wasn’t to pleased. Upon the return, only one driver was on duty and our wait from phone call to pick up was about 45 minutes and then he picked up a party before us and we had another 20 minutes to wait and we then went to another ship to pick up a party of 6. There should be a disclaimer of probable delays - or require the independent shuttle co to be able to accommodate the people - and the luggage - going to and coming from the cruise port. 6 ships, at minimum, 2500 passengers each - and only one or two drivers - do the math??? Great location, nice price and nice sutthle. Expected a paved parking lot not a dirt lot full of garbage! Parking lot is awful- huge chunks of concrete and broken asphalt... Very lucky our tires didn't get shredded. Took 45 min + for the shuttle van to arrive, waiting area consists of a rotted bench in the sun.... Shuttle was quicker on our return, but they crammed so many ppl in, they were literally sitting on the floor of the van!!! Time to find a new company next vacation! The lot looked like an abandoned building lot. My car was broken into while on my cruise. This is not what was expected based on ratings and information on the website. Parking lot was difficult to find coming off of I 95 as the sign is facing the wrong way. The parking lot is in very bad shape, although we were lucky to park near the entrance, moving luggage on the surface was very difficult. The wait for a crowded van on the return was much too long. Broken down parking lot with rough terrain. Rude and delayed pick up and drop off. Will never use again. They threw our luggage on the ground when we got to the ship. Great experience! Shuttle driver both to and from were very courteous and helpful. Our car was waiting when we got back to the parking lot. Cost was extremely reasonable for the amazing service. 1st: Road leading to parking lot was closed due to road construction, detour lead us to a dead end. 2nd: We had to call parking attendant who had a very thick accent and was hard to understand. 3rd: He was finally able to get us to the lot which was being shared by heavy construction equipment, piping, bricks, and in a very sketchy area. 4th: He packed way too many people in the van, people sitting on laps. We made it safely to the port. 5th: Upon returning we called for pick up and he stated the lot didn’t open until 8am. It was 7:07am. We got a cab, who couldn’t find the lot and we eventually got out and walked the last block and a half to our destination in fear of our lives due to the many abandoned buildings and people sleeping on the streets. This was the most horrible parking experience ever. Horrible! I will NEVER use you guys again and I will make sure no one else I know does either! Lot was trashed with broken glass (right by my tires) and garbage. Attendant didn't seem to understand or speak English. SHUTTLE service was the worst I have ever seen! 13 people squeezed in a 10 passenger van and very rude driver who hates his job (understandably so). Feared for my children's safety due to a total disregaured of vehicle safety. Multiple stops and repeated stops instead of getting us where we needed to go. Worse experience EVER!!! I HAD TO TAKE A CAB TO GET MY CAR. I CALLED AND YOUR DRIVER SAID HE WOULD BE THERE IN 25 MINUTES, I WAITED 45 MINUTES WHEN I CALLED THE DRIVER AGAIN HE SAID IT WOULD BE ANOTHER 30 MINUTES SO I TOOK A CAB. IT COST ME $15.00. ON TOP OF THE COST FOR PARKING. Parking and shuttle service was very unorganized. Only one shuttle van was being used and another was available but not being utilized. On arrival back at the port, we waited for over an hour as two pickups were full. Finally we took a taxi to the lot to retrieve our car. We did not see any one there at the lot. As we pulled in to the lot, another taxi was there unloading people from the ship. It is a shame that someone has to hire a taxi when a shuttle is supposed to be included. This was a very poorly run operation and we will NOT recommend or use this company again. Website to make reservations indicated this location was a parking garage. When we arrived, it was an over-crowded surface parking lot with chain link fence, in suspect neighborhood. Price was good. Quick easy drop off & pick up. Jose was great with directions to the parking lot. To a timely pick up to and from the port. Great, just like all the other times! Need a sign saying the street numbers until construction is done. Parking is pretty scary and dirty. But for that price i think its correct. While our shuttle driver was ok I was not very pleased with the location for parking. The lot was in what appeared to be a construction site and it was pretty poor condition. The lot was not paved and was cramped. We're not coming back, guys. We were left stranded at the port on the way back. We disembarked early from MSC and my wife called at 7:15 am. I had told her not to and that was confirmed with a call back at 7:35 am stating the installation did not open until 8 am. Thereafter we received a number of calls from the driver saying he was on his way. At 10 am we gave up and took a taxi. Park spot within several blocks of port. Vehicle was in the same condition as we left it. I believe the company needs more drivers. We waited an hour after disembarking to be picked up and spent another hr. driving around and picking up other guest. Might be better to give a specific pick up time to each passenger based on cruise ship. There were instructions to call for the shuttle when we were about half an hour away from the parking site. Because the parking site doesn't have their own shuttle they have someone else shuttle you. So we did call the shuttle service when we were half an hour away. Driver told us he would be at the lot when we got there. He wasn't. The owner of the lot called when we got there. We waited for over an hour for the shuttle to get there. Then the shuttle bus driver told us he was pulled over at the port. And that it didn't matter because we called before we were at the lot and hadn't parked yet. I told him that we did what we were suppose to do and that I wasn't going to argue with him. All the way to the ship he continued to try to argue. Although we continued to ignore him. When we got back from the cruise the ship was a little early so we called when we were outside the ship. The shuttle bus driver told me it wasn't even 8:00 yet and that we were to wait where he instructed us to wait he would be there between 8:00 and 8:15. Needless to say we were not going to wait an hour for the shuttle so we got a cab back to the lot. This shuttle bus driver was very rude because he knew that he was the only shuttle bus driver that this lot had and thought that we had to deal with it. The driver was nice. The van was clean. the parking lot was decent. My car was in the same shape I left it so I was satisfied. The price was terrific. Not far from the port. The Kost per day was not expensiv. The time for waiting for the shuttle was only 10 minutes. When we arrived at the lot, we were expecting s garage, but it was s surface lot. The fence was half down. Graffiti on the buildings surrounding the lot and vagrants loitering. We opted to park elsewhere rather than risk it! I don’t reccomend this lot! Shuttle service was only for 2 people and we had to pay 10$ per each way. He didn't come on reserved time. We were disappointed with the service. Waited 45 min for the shuttle from the cruise port to be taken back to the car. Finally I gave up and called an Uber. Then after an hour, the driver finally called me. Not satisfied at all!! Your driver gave good instructions for my return. He answered my call and arrived to take me to my vehicle at the time he gave. I will use your company again. The day I was arriving I could not contact the office for a copy of my originial receipt. I called and called and it just went to voicemail. Thankfully the driver let me on the van so I would not miss my trip!!! The parking lot was a little bit sketchy but thankfully my car was fine. I considered several parking opportunities while on my two recent cruises. Based on my research Instapark had the best reviews and pricing. The lot was not as secure as I had initially been led to believe. In fact the first time I used it from 16-23 September we could not find the entrance. We ended up circling the lot a couple of times and actually ended up entering via the Construction area, not the Instapark entrance. Due to the Construction entrance, anyone has access to the lot, so it is really not secure at all. The Lot is also littered with trash and debris. Some of this was due to Hurricane Irma, but there were also cans and bottles just thrown on the ground. Though I did not specifically look for one, I did not see a trash receptacle. The Shuttle Service worked very well. Jose was usually available shortly after I called him. My experience on 25-29 September was about the same. On the positive side, the sign at the entrance which had been lost during the hurricane was replaced making finding the lot easier. I know from talking with other customers that others also had difficulty locating the lot. The entrance is not in 700 N. Miami Ave. But in 8th St. It should be made clearly written in the website. Maybe just a little more space between cars. Jose was wonderful and courteous! There was no entrance from Miami Avenue. Info was not updated online and sign for parking not very visible. Lot is barely marked. Not sure if there was a bigger sign that got lost in the hurricane, but it looks like a construction site instead of a parking lot. It is fenced and there are building supplies from all the construction going on around the lot. I understand that the shuttle service is operated by a private company. There is no shade area to wait and the lot is not paved. The van on pickup at the docks also had people to drop off, which was done after pickup which meant we had 13 people in the van. As long as you are aware of these things and don't mind the wait and unexpected ride around, the price is a great savings over parking at the pier. Took a long time to be picked up on the return. Not happy about the vandalism in the lot either. All the cars were broken into, including my families car. The windows of many cars were shattered as looters easily got in and did as they pleased with the parked vehicles. No transportation back to my car. Was told to call uber. I will seek a refund. The parking is not in a secure lot , it's very misleading one part of the lot is locked but if you drive around the other part is wide open , two entrances and one is a gate that does not even close. As a matter of fact the lot is a construction site . Very open and not secure . Very convenient. We stayed at a local hotel nearby and my truck was an issue with the parking garage. No problem here!!! The lot we parked in needed paving. It was all ground and gravel like a construction site. Everything was fine. just a suggestion is pavement the parking. When we arrived we couldnt find the place. There was a lot of construction going on. I called the number and nobody answered. I left a voicemail and nobody got back to me. I didnt want to be late for our cruise so i was forced to park elsewhere. I am requesting a full refund. Website says 15 to 30 minute wait time. Lot sign says ever 30 minutes. However, we called the shuttle driver Jose and he said the other driver was there but we had to wait on other people in the lot before he picked us up and would not let us load the shuttle. He was rude on the phone. We called after 15 minutes and said there was traffic because of the heavy rain. It then began to rain so we had to reload our luggage. It took him 45 minutes before we were picked up. It was raining and he didn't even get out to load our luggage. Jose was not apologetic and was again rude. Aside from the shuttle service, the parking attendant had me back in to a spot. I noticed construction in the area and he had me back my car in by a handful of scattered screws and nails. Thankfully I didn't get a flat. I would not recommend this lot. The only thing keeping it from a "great" experience, is the amount of time we waited to be picked up upon disembarkation - 50 minutes. I would suggest that the pickup hotline be answered before 8:00, for those cruise customers who get off early. Otherwise, next time I will take a cab back to lot. Everything moved along perfectly. Easy to book online. Lot attendant contacted the shuttle driver to find out how long the wait was for the next shuttle, 5 minutes. Shuttle driver got us to the ship with no problem. interior had ripped seats which are uncomfortable. All around great experience. We was parked instantly upon arrival with a shuttle van waiting on us to take us to the terminal. Upon departure the shuttle was very prompt into taking us back to our vehicle after the cruise as well. My car was kept safe and secure. Parking there made it so much easier getting to the port and back without all the stress. A larger sign designating the lot entrance would be helpful. The lot really is just a dirt/clay/limerock surface adjacent to a construction site. There's a chain link fence around the lot that's closed and locked outside of lot hours but there's also a sign that indicates the company isn't responsible for damage. The shuttle driver is super nice, easy to communicate with via text or phone call. He's available and helpful. I'd recommend both the lot and the shuttle for anyone looking for a less expensive option than the actual port parking garage. We had a great experience. The shuttle took us to the port the second we parked and Jose picked us within 10 minutes after calling him after we got off our cruise. Jose is for personable and friendly. Very professional. I would definitely recommend parking here for a cruise. Entrance to the parking lot was somewhat confusing, guess due to construction in the area. Experience was good on 8/7. On 8/11 we called before disembarking and had to wait longer than expected. When I called back driver told told me I hand't called before and waited for another 5/10 min. ...??? Driver was sleeping when I called him . He said call me after 8 am while when I've called it was 8:15. He said I'll call you back and never did. Took him 50 minutes to get to the terminal while me sitting in the sun with my 7 years old son. Polite parking attendant & shuttle driver. Expected a building of some sort, was just a fenced in gravel lot. Easy to miss if you're not paying attention to details. The area to park your vehicle was a construction zone. I was worried I would drive over a nail. The ground was full of potholes and muddy water. The fence was very weak, leaning and raggedy. It wouldn't keep a toddler out. Once I arrived back from my cruise I called to get picked up. Only then was I informed that their vehicle had broken down and the guy I spoke to was busy waiting on another passenger. He tried to tell me to take a taxi or Uber. I had a 14 hour drive ahead of me and did not have time or patience for his foolishness. After I threw a little fit and about 30 minutes, he scheduled an Uber to come and take me to my vehicle only to get to the garage and the road was blocked off and they had not placed any signs telling their customers where to go now to enter the garage. Luckily I was picking up and not dropping off because I remembered where we exited the garage previously and directed the driver in that way. Even the Uber driver was unpleasantly amazed at the conditions and security of the Parking area. Great place to park! The transportation to and from the port was excellent! The area was secure. Prompt responses on making sure someone was available to take us to the Port of Miami and back to the parking lot on our arrival back from the cruise. Thanks for the great service!! Mr . Jose the shuttle bus driver was so patient and curtious. I had to tip him. He had a lot of demands from other customers but I thought he handle him self well. Everything was good. The person of shuttle Jose was very nice and punctual. I was lost at first because there was no name on the parking lot or maybe I didn't see so I passed it twice but once I parked it was great. The attendees were very friendly and the trip to the terminal was fast. I definitely recommend this lot to anyone who goes to Miami and I will always park there from now on when I have to travel from Miami. The kind of customer service I got here I expected at the actual cruise port parking lot. They were extra nice, accommodating, helpful and overall just made my experience really seamless and simple. It's about 10 minutes from the cruise port and the further you get from the cruise port you get, the less the lots seem to care about service or safety but this one goes above and beyond to make sure their customers are happy and that all the cars are safe! I was so excited to find a location that wasn't too far from Port of Miami and still had fantastic service. Great guys at the parking lot! This lot is just 10 minutes from the cruise port which is great! You don't have to go far at all to make it over there, so no matter what time you have to depart, you're more than likely going to make it on time with lots of extra time to spare. The parking was great and secured. I would park there again. Really good price for a really good lot! Was worried at first that my truck wouldn't fit in here but it did! They make special accommodations for large vehicles so I was super happy about that! Probably the most perfect location for a parking lot this size, since it's so close to the cruise port. it's really the perfect distance away and you'll be there by free shuttle in no time flat! Such a great lot! Definitely recommending this place to others so they can see how great it is too! Great/fast/easy service with the shuttle. Entrance is on 8th Ave instead of 700 N Miami Ave. so with the one way streets you could end up doing some loops if using GPS. Great service, shuttle driver Jose was very polite and helpful with my luggage. Shuttle van was clean and AC was cool. Many thanks and appreciation. GREAT price at the lot here! Kept me well under my trip budget because I'm used to paying so much more! Great efficient service. Jose was very professional and extremely helpful. Excellent service, smooth process couldn't have been better. From booking online to drop off and pick up. Such a good here! Definitely get your money's worth when it comes to service too! Very safe place to keep your vehicle while you're away! Didn't have to worry about a thing as far as my car was concerned. Such a convenient location! Words can't express how pleased I am with the service here! From the moment I arrived, the customer service was absolutely fantastic. I pulled up and right away an attendant helped me get to the best possible spot and even helped me get my bags out of my car for me. After that, I checked in with another attendant who made sure I had a full understanding of how everything worked before I left my keys behind. I had a LOT of questions and he went above and beyond to make sure I had all the answers I was looking for. About 10 minutes later, the shuttle bus arrived again to pick up myself and a few others who were waiting at the lot! The driver was so pleasant and helpful and loaded all of the bags into the shuttle bus for us so we didn't have to, then brought us all over to the cruise port which took about 10 minutes! All in all, this was really great experience and all of the staff along the way were really gracious about making sure we all had a great experience. You can always tell when staff members take great care when it comes to their jobs and it definitely shows here! Great work and I'll be parking here in the future also! Perfect location for this lot! Really close to the cruise port and the shuttle bus ride over was really fast. So good. This was the perfect price because I've come across some expensive cruise parking lots in my day. This was a great find! Shuttle bus was so fast and I didn't have to wait long for it to arrive at the lot at all! Trying to get up close to the cruise port can be tricky, since parking in Miami is so hard to come by. This lot is the perfect solution and it was a great place to leave my car behind during my week-long Caribbean cruise! Pro - Jose was wonderful, a man of his word, professional and gave me confidence in your service that I did not have. I was prompt in his roundtrip service and I would use him again and again. As a travel agent, I would recommend him to my clients. The price was fantastic! Con - The parking lot itself had so much trash scattered and did not look like a parking lot it kind of freaked me out. When I arrived I was very suspicious and I was very nervous leaving my car in the lot. However, after calling I was assured I would be safe and I trusted. Everything went well and I found all as I left it. I do hope there is a plan to make the lot, more a parking facility, than a mess. My only small complaint is that there's no valet service, but other than that? Phenomenal! Outstanding service outside of that! Definitely a budget-friendly kind of place. So many of the other parking places cost so much, but this one is perfect and the lot itself is great too. Best price-point for a parking lot like this, definitely very happy that I came across it and that I didn't have to pay some crazy price to be so close to the cruise port. The security on staff were a great addition since I already felt good about the lot and what they had to offer. When I saw they had cameras and security guards there also, I knew my car was going to be just fine while it was here. Happy i found this spot so I could park really close to the cruiseport without having to worry! It was so great and I've been telling everyone about this place. I didn't have such a great experience here sadly and it's a shame because the staff was really nice but nothing could save my bad experience. I booked my spot online ahead of time for a certain date and time but then they delayed my flight by a day and I had to change my parking time online. Unfortunately there was nowhere online for me to do that so I called in. The lady on the phone sounded really nice and helpful and she said she changed my reservation for me so i thought all was good. Basically, when I pulled up the day I needed to park now, I was told that my reservation had "already passed" and that I wouldn't be able to park. I could clearly see that there were plenty of opens spots in the lot that were available but they said they were all reserved already which I find hard to believe. Anyway, the staff were nice about it at least and gave me some suggestions of lots nearby to try but I was very annoyed because I had to drive around looking for them and ended up paying more than I would have with this one. On top of that though, they checked me in as if I had arrived at the lot and I saw a charge on my credit card bill for the amount that I would have paid if I really parked there. I called in and they fixed it right away but it just seemed like such an annoying oversight to me. All in all I don't think I would park here again unless I was sure that my flight date and time wasn't going to move. I was pleased with Port of Miami Discount Parking for my 7 night cruise. I had no issues with shuttle service getting me to the ship for departure. The only negative was shuttle service is not available until 8am upon arrival. Our cruise ship arrived back at 6am and we had to depart off the ship at 7am. The positive was that it was only a 25 minute walk since it is pretty close to the port. For only $65 for the entire week, I would recommend this service. Perfect parking location right here, definitely somewhere I'll be parking again anytime I need to get on a cruise. All the other options around here are pretty expensive and don't feel as safe as this one. I saw one on my way back to pick up my car that has no lighting at all and I didn't see anyone on-site! This is definitely the best one in the area. Price I paid to park in this lot was perfect! I only stayed a few days but for my final cost to be under $50 is amazing considering plenty of lots in the area charge $20 per DAY to park there. Good job Port of Miami parking! I pulled up and it was great because the attendants helped me figure out where to park right away, then got my checked in with no problems. After waiting for a little over 5 minutes after parking my car, the shuttle bus pulled up and right away the driver got out and put my bags onto the bus for me. So helpful! The ride over was just about 10 minutes, which was perfect because I timed it to match up well with my departure time. I was worried I would be waiting a while for the shuttle to get there and take me over but that wasn't the case at all! Really great lot and definitely parking here again the next time I have a cruise to go on. Dropped off promptly, picked up promptly, everything as expected. This lot is in the perfect spot and I'm so happy that I found it! Very close to the cruise port so you'll be more than on time for your cruise departure. Usually I don't like using these parking lots because they're too big, not secure enough and are pretty far out from your final destination but this one was the perfect mix of everything I needed so it was perfect for me! Great place to park, near port and price is over all the best price. FYI, they do shuttle to the cruise terminal. Thank you. Amazing lot for an amazing price! Very glad I found this lot and didn't have to park in any of the ones that are even further out, smaller but more expensive for some reason. 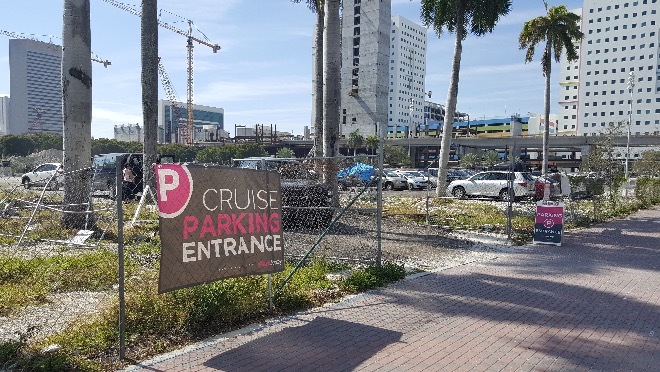 At $8 a day, this is one of the best deals that you're going to find for parking so close to Port of Miami! Such a great deal and I'll be parking here again in the future. Miami is a busy and hectic city so finding parking that's safe can be tricky! This lot is on the larger side but they have some pretty key security features that make it safe for every car parked here. It's well-lit, fenced in, has cameras and has security on staff too. There's so many people that work there, it would be impossible for anyone to breach the lot so if you're looking for a safe lot, this is it. Excellent location. Maybe 5 minutes to the ship. People were friendly and helpful. Only disappointing thing was the lot was dirt. So your car is in the weather 24-7. We were pleased with your service....thank you! Best location for a parking lot! Great service too! The customer service here is really amazing. The staff was so helpful to me and even when I had a million and one questions, they took the time to answer them all! I was a bit apprehensive as I was dropping off my keys and had a little bit of time before the shuttle bus came back, so I was asking about the lot, how they keep it secure and if they've ever had any issues in the past and they were so open with me about everything it was really awesome. I gave this place a 5 star rating and I would give it more if I could! That's how great the service here was! Even when the shuttle bus came, the driver started loading all the passenger bags into the back so it was like one less thing to have to worry about. They really take care of their customers here, and I'd park here again in a heartbeat! AMAZING location for this parking lot, it was so close! Definitely the best price in the area for this kind of parking. Parking at the actual cruiseport is obscenely expensive so this is the perfect option for those who want to be close by but not have to pay those kinds of prices! how can you beat 8 bucks a day? Horrible horrible service. Same as other reviews we paid extra on line to have 3 extra people only to be charged again when we arrived. The day we got back from the cruise we did as we were told to call Jose the manager for a ride. Tried for over an hour to reach him no answer. No answer at the at insta park either. Ended up having to pay 40 extra for another shuttle to take is to our car. Shuttle bus service was fast and efficient just the way it should be! Came back to find our car safe and sound, which is all we asked. Got a shuttle ride to and from. A great experience overall. A definite recommend. Price was perfect for me, since I was trying to stay under budget. I was gone for 2 weeks so I needed an option that wasn't going to come up to too much after it was all said and done and I did! VERY close to the cruise port which is perfect! Great place to park! Soon as I pulled up, staff was so helpful and got checked in and parked! Awesome service! 2nd time parking here and as usual everything went great! Thanks! I was worried about the car being parked so long in a very sketchy neighborhood. When I came back a week later, the car was just as I left it. It's about a mile and a half from the port. I walked to and from the parking lot because it's a lot faster than waiting for a shuttle. Took me less than 30 minutes. Was worth the cost savings. Because the lot is so big I wasn't sure if it was going to be safe enough for me to leave my car there but once I saw the security guard and the surveillance cameras I knew it was going to be just fine. The staff here basically treat your car like it's their own; that's the kind of responsibility and care they take. I felt really good about leaving my Kia here after asking the staff some questions about how everything was going to work and they explained everything to me. By the time I got onto the shuttle I knew I'd have no issues returning to find my car just the way I left it! Definitely one of the best locations I've parked in when I needed to hit the cruise port. Perfect spot and I was really close by so my ride over was fast and I didn't have to worry about getting there late. Really excellent customer service! Staff here was so great! Very prompt. Car was safe. Gentleman saved the liquor I left in back seat. Had to drive back to get it. Did not have to wait long. Will do it again. I was so glad I found a parking lot that was this close to where I needed to go. Parking anywhere in Miami is usually such a headache so it was important that I found a good spot to leave my car while I was gone and this was the perfect one! Such an awesome price! Just $8 a day for a lot this size and not too far from the cruise port it was perfect for me! The shuttle bus service was awesome! Only took 10 minutes from the parking lot to the cruise port and the driver helped get my bags into the shuttle, that was so nice and helpful of him! I was a bit worried about my car fitting in this lot because it's a truck but I had no problems with Port of Miami cruise parking. They have extra wide spaces that are tailored to accommodate larger vehicles so I didn't have to worry. In lots I've parked at before, I've had problems with there not being enough space and cars bumping and scratching mine while I was gone. This is one of the best lots in Miami because I didn't have to worry about that at all. Parking here all the time now! Parking at 700 N. Miami Ave was horrible. Stay away from this parking lot. Upon arrival at the gravel and sand dusty lot we stood in line in the sun for 45 minutes only to have a small van show up that took only held approximately six (6) people leaving the rest of approximately 15-20 people standing there. The driver said curtly that he would be back in another 45 minutes. We ended up paying for an Uber to get to the ship. Upon return there was no transportation available so we ended up taking a taxi back to the lot only to find the gates locked. Shortly afterward the gates were opened and a man nastily asked for our phone number so I could retrieve my dust covered car. I don’t mean dusty I mean dusty from the point that the car looked like it had been abandoned for months not the week we were gone. We were out almost $25.00 in Uber and Taxi charges for something that was supposed to be included. I wouldn’t recommend this lot to anyone including my worst enemy. The absolute perfect location! I'm honestly really happy I came across this lot and didn't have to go too far to get to the cruise port! Best price for any cruise port or airport parking anywhere in Miami! It's so great. Your shuttle driver is absolutely horrible. He was rude when we called for pickup. He arrived and handled our bags as if they were trash. He broke one of our bottles that we had bought from one of the ports and offered nothing for it. As we were riding back to the facility, passengers called to get picked up. He was sooooo rude. I cannot express how very bad my experience was. Just a horrible way to end a vacation. I will never use this facility again and wouldn't recommend it for anyone else either. The shuttle bus ride over to Port of Miami was only 10 minutes so I know I was really close by. It's hard to find lots that are this close by especially that don't charge a fortune to park there. What I paid for a week is what other lots charge per day, so I was really grateful that I found this place and didn't have any problems with the service of the location or anything else about the lot. It was basically perfect. Zero complaints! Service here was phenomenal and really a seamless process from beginning to end. Even booking the spot online was way easier than i thought since many other lots still require you to call in. This one is a real gem! Great price and excellent service to match! Really an awesome place to park! $8 a day is such a great price! This place was recommended to me by a friend who parked here before and everything they said was right! I had a really good experience here and I'm going to pass the info along now too! Very safe lot! Didn't have to worry about a single thing while parked here which was perfect and awesome! This was such a good location for this lot and I knew I was close when I could actually hear the cruise port and ships in the distance which was pretty cool. I knew it would be a good experience after that. The customer service here was really great! All the staff was so nice to me and helped with anything I needed before getting onto the shuttle, it was awesome! Absolutely perfect location for this parking lot. I'm glad I was so close to the cruise port because I didn't want to risk being too far out and taking a long time to get to the cruise port. The last time i did that, I ended up almost missing my cruise! This spot is perfect for avoiding that which is really cool. Price is right on the money! Kept me way under budget and the service was pretty fabulous too! I wasn't sure at first if this lot would have enough room to accommodate my SUV but was pleasantly surprised when I had more than enough space and didn't have to worry about any cars bumping or scratching mine. That's a real issue I've had in the past with parking lots, and I've had to pay a lot to fix dents and things like that! I didn't have to worry about that here because not only were the lots bigger than usual but the staff here take their time with guiding the incoming and outgoing traffic so they don't bump into the card that are still in the lot! It's really a great lot to park in, especially if your vehicle is on the bigger side. This just might be the perfect parking location! It's so close to the cruise port and parking in Miami can be really hard to come by! You're only 10 minutes away and the shuttle bus can get you there in no time. Exceptional service at this lot! The price was really good and after leaving my car here for a few days, the total wasn't too high at all. They charged it to my credit card so I didn't have to wait and fumble around with paying as I picked up my car - I was able to grab my keys and be on my way right away and they took care of the rest! Price was right so i booked it right away. Very satisfied with the service here and have been telling other people to park here too. It was really good parking here and I'm glad it worked out for me. This is definitely one of the safest places I've parked my car and I'm glad that I found it at the last minute. I was going to park at another more expensive lot until I stumbled across this one online and made the switch once I found this one. Such a great find! Stay Away - I have only read two reviews for this location and it does not appear anyone has anything to good to say about them. Our arrival and trip to the port were uneventful. We were told to wait in the same area where we were dropped off for pick up on our return. We called for a pick up and we were told that due to traffic it could be 20 minutes up to a possible 30. OK - but an hour later we were still waiting. I called again and had to leave a message. No return phone call. I called the office number and asked where our drive was. What were looking for? Color of vehicle and what name? Obviously we had missed them because they do not come looking for you nor do they come to where they dropped you off. it was by chance after we got the van info that they were spotted in the back of the pick up area. Ran to them and confirmed it was them and asked them to wait as our bags were at the front of the pick up area. Ran back to get spouse and bags and as we got to the van, he pulled away! Left us standing there! This is an hour an half later! Lucky us, they had sent two vans because one was hauling luggage and the other carrying passengers. Well the passenger van could not be opened in the rear to load our luggage. The people already in the back seat had to get out so the driver could toss our luggage over the seat. Then we squeezed 5 people on a 4 person seat. It was worth it just to get to our car. Will never use this outfit again. do not recommend them to anyone. Like the other reviews say - it is a construction site and your car is absolutely a mess when you get to it! Horrible experience. The savings was not worth the aggravation. This parking lot was so close to the cruise port and I'm glad that it took me just a few minutes to get over there by shuttle bus. Easily one of the best parking lots near Port of Miami and I can't see myself parking anywhere else besides this each and every time I have to get on a cruise. I've been sharing this lot with everyone that I know and when my friends and I went on the last cruise together, we parked here just to make it easier for all of us. Worked out great! Such superb customer service here at this lot! The staff were experts on the service and very helpful in giving me all the information I needed. Felt a lot better about parking here after they told me all that I needed to know. It was so great. VERY close to cruise port! Shuttle bus only takes like 5 - 10 minutes to get there so it's perfect! Price was so wonderful and made the whole experience so much better. So elated I ended up going with this place as a parking option instead of at the actual cruise port which would have ended up being WAY more expensive! Shuttle bus service was actually so perfect for the lot. After parking, I was able to get help with taking my bags out of my car and get it into the waiting area where I didn't wait more than 5 minutes for the bus to get there. As soon as it did, the driver (who was lovely, by the way) got out and started loading all of the bags into the bus for me, so that I didn't have to! After that, the ride over was super quick and brought me right up to where I needed to get to my cruise. The staff was considerate, friendly and really all around helpful. Definitely a service I would use again in the future and tell people to do the same. Absolutely marvelous location for this lot. So close to POM it blew my mind. Staff here was also super nice and helped me with all of my questions. Awesome service here. Service was way more than satisfactory, and if I could give it more than 5 stars I would! Made reservation day prior to departure thru internet. After dropping of the family, drove to the lot. Fenced gravel parking lot, nothing else. Presented an email from the company with confirmation number. Was told where to park. No problem there. Was driven back to the port. Received explanation for the return date on where to wait for ride. Upon return called the number provided ,was told the driver was on his way. Precisely at the promised pick up time driver came, took all people from same ship, brought us all back to the parking lot. No problems. Just like I have expected. Price was way below what I budgeted for, which worked out super perfect in the end. Other than a filthy lot, it was just O.K. Upon calling the number given by the driver, they were there in about 10 minutes. Had no problem with the reservation which they placed on the dashboard. $8 a day is an excellent price for such outstanding service so it's a good thing I found it. Such a good find! I was a bit apprehensive at first about leaving my car here, since it's such a big lot. Talked to the people who work here and they made me feel a lot better about it all. They told me they have never had any problems with theft or tampering, I saw the security guard and they even showed me where all the cameras were. After that, I felt much better about the situation and knew my car would be in some great hands. For Miami, finding parking that's anywhere close to where you need to be is almost impossible so this was such a great find on my end! Excellent service, friendly staff and all at a really good daily rate too. It's essentially the perfect parking lot. I was really satisfied with the level of customer service I got at this lot, and how eager the staff was to help me understand everything before I got onto the shuttle. They answered all of the concerns I really had and made sure I was more than comfortable with everything before sending me on my way. Luckily I had a few minutes before the shuttle bus got there, so I got a chance to ask everything I wanted to know. At one point, I even had the manager come out and help me out as well and they let me know they appreciated my business! They truly went above and beyond to make me feel like I made the right choice and this is definitely a place I would park again in the future. I take cruises pretty regularly and I was using another lot almost exclusively because it was the only one I knew about. Since making the change, it's very unlikely that I'll be using the old lot ever again! So glad I made the switch! Locating the lot wasn't easy since their lot didn't have a large sign. Had to wait for the shuttle for about 30 mins. There was only 4 of us so not much of a problem. On our return we had to wait about 20 minutes for the shuttle to pick us up. Overall experience wasn't so bad for the price. Was it because it was slow season? This lot brings you so close to the cruise port without very high pricing! Very very good service here too. Truly a fantastic price! It's one of the better lots in the area as well, as so many of the other ones are not well-maintained and not really that safe. This lot is not only big but they keep it in great shape, it's well-lit, there's fencing, security and plenty of good stuff without it costing a fortune just to have great service. Excellent lot to park in and parking here again soon. Best parking lot location in Miami. Just a few minutes from the cruise port so it's perfect! Absolutely no complaints about this place! Couldn't have asked for a better lot with better service! PERFECT price for a perfect lot! Got all I needed and more from this place and I'm so glad someone told me about it. Best place to park in Miami hands down! Wonderful price here very glad I didn't have to pay over $100 just to park for a few days! So good for long-term parking too if you're going to be gone for a long period of time. Don't think I've parked at a lot much safer than this, so I'm glad I came across this place when I did! I was looking for a new place to park because Miami lots can be tricky. It's hard to find everything you need service-wise but still for a good price but I found it here! Such an awesome lot! Basically the best possible parking lot location in Miami! It's basically impossible to get closer to the cruise port than this without paying a lot more money! Great work guys! The customer service I got here was truly amazing!! As soon as I pulled up, the attendant helped me to get to a good spot in the lot, guiding me and making sure it was a spot that worked for me. Then, they helped get my bags out of the trunk since they were pretty heavy and carried them to the shuttle bus pick up area for me. I wasn't waiting long at all for the shuttle bus to pull up and I hopped in after the driver put my bags in there for me! Everyone that works here is so nice and helpful and went out of their way to make sure I had a good experience coming out of it. When I came back to retrieve my car, I felt the same way. The checkout process was pretty quick, they charged my credit card for my stay and I was able to hop back on the 101 and head straight home. Definitely parking here again! STAY AWAY - this lot is horrible, looks like a construction demolition site, rebar sticking out of the ground and chunks of crushed concrete scattered all over (I was concerned about getting a flat tire). Shuttle to the port was ok however other passengers that had more than 2 travelling in the shuttle were told the price they paid online for additional passengers was not correct and they would have to re-pay the higher amount and go after the online booking site to get the credit back for the original amount paid. Return shuttle service was poor, when I called I was told driver was busy and to call back in 20 min, when I called back was told shuttle would be there eventually. Another passenger and I were waiting and ended up taking a taxi to the parking lot as we could not get any information on when we should be seeing the shuttle. We were extremely disappointed with our experience with the parking lot at 700 North Miami Ave. Upon arrival the men working the lot and shuttle repeatedly attempted to obtain additional payment even though our reservations were made in advance, online, and paid in full. Transport to the cruise ship departure terminal was relatively uneventful. We were instructed that we would be dropped off at terminal B and that that was where we were to board the return shuttle at the conclusion of our trip. Unfortunately, given that our ship, on return, docked at Terminal J there was no way to feasibly get to the shuttle and return to the parking lot. I called the customer service line for Instapark and, even though this was a weekday mid-morning, was only ever able to reach a recording telling me to leave my name and number. In the end we were made to take a taxi back to the parking lot at a cost of over $17, thus negating much of the savings we were to have had by parking there in the first place. One driver in our party had paid extra to have his car washed while we were away. This did not happen and in fact the car was markedly dirtier due to construction in surrounding areas. I will be posting this review on tripadvisor and other sites in order to hopefully help others avoid this extremely disappointing experience with Instapark. Perfect location! Very close to the cruise port. Park here and you'll be more than satisfied! Fantastic price here for a fantastic lot! Service was more than on par and for $8 a day it's really a steal. This lot right here is a gem. Good, I found my car in good shape as I parked it. AAAWWWFFFUUULLLL....car was safe but if I could find another place I would have. Drop off was ok. Said shuttle was free for up to 2 people per booking and we had 2 bookings yet they still charged for the 2nd person. Pick up after waiting for 30 min was told best to take a taxi as there were 20 people ahead of us. So spent out own money to go back and get out car. Only use if you have no other choice. Exceptional location and really good service. Super glad I saved my money and parked here instead of the lot I normally park in. Made everything way easier, way cheaper and I also got much better service. This is probably the safest place I've parked my car in Miami for quite a few reasons! First, it's so close to the cruise port which is already an area that's pretty well secured. Also, there's plenty of staff here including counter staff and security guards who make sure the lot is safe at all times. The lot is well-lit, fenced in a bit and also there's plenty of security cameras. This makes it a lot easier to keep an eye on what's going on in the lot. The staff here let me know that they haven't ever had a break in problem here which definitely put me at ease. They do everything they can to make sure you return find your car the exact same way you left it when you started your trip. The service is excellent and the price wasn't too bad either. Parking here every time I'm heading on a cruise in the future. Being so close to Port of Miami is perfect and makes things a lot easier in terms of getting over there. Shuttle bus ride was super quick! Fantastic price! Really good parking lot! SUCH a great price. Was really surprised to see it was only $8 a day when most of the lots around the area and in Miami in general was way more money! This was a great deal and good service to boot.